Seven boys in a back yard playing a game that would appear to involve throwing a ball or a stone into a line of upturned caps. It is the kind of game kids couldn't play today for what self-respecting child of the twenty-first century wears a cap? It is the kind of photograph that couldn't be taken today because it is hand-tinted. But it is the kind of theme image that would make any self-respecting Sepian think of caps, or children, or playground games or any of the hundreds of things Sepians like to think of. The photograph is from Norwegian DEXTRA Photo Collection stream on Flickr Commons and dates from the early part of the twentieth century. 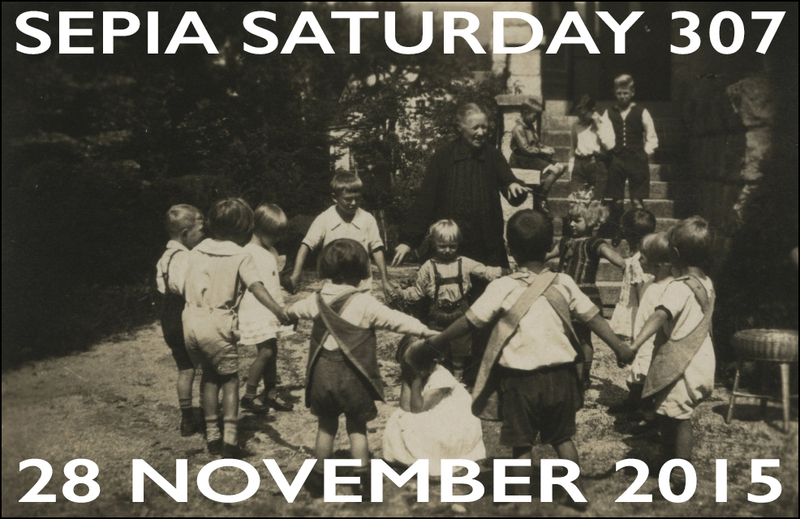 Unlike the strange game the boys are playing, there are no complicated rules to Sepia Saturday - all you need do is to post your post on or around Saturday 21 November 2015 and add a link to the list below. 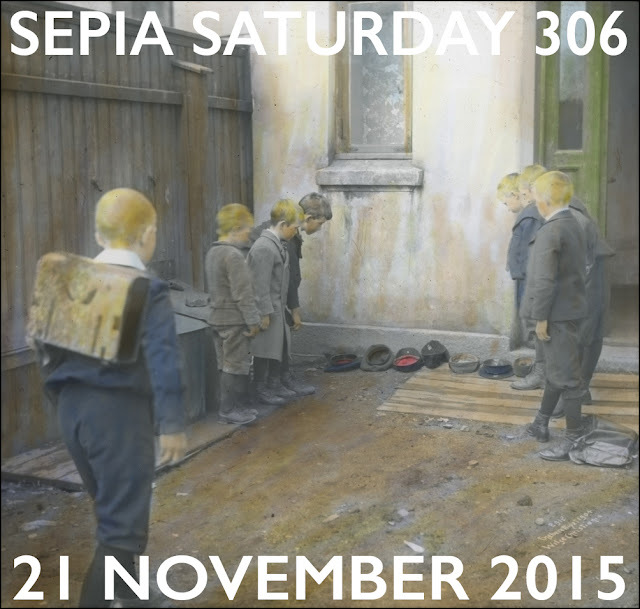 Whilst you are waiting for your turn to play have a look at what is around the corner and waiting for us at Sepia Saturday 307. And you shouldn't need telling by now, you can see all the themes for the rest of the year HERE. 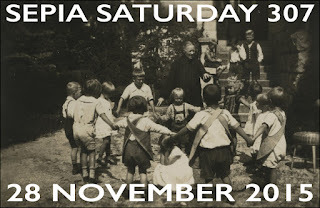 But now it is your turn to play Sepia Saturday 306. Take careful aim and off you go. Ha! I'm surprising myself. Numero uno to post this week. Hope to return more frequently again. I offer you some caps of sorts, with kids! I'm early this week too for once. I'm sort of on theme. 4 Detroit school boys about 1920. Wearing caps. What well dressed boys were wearing in the first half of the twentieth century! Boyz and their many variety of hats! Lots of boys, lots of hats. Plus music. No new post from me this week as I have been busy updating last week’s post after new information came to light. I couldn't find a family photo which complemented this week's prompt so I tidied up some family history research instead. My post has nothing whatsoever to do with the prompt photo, sorry! But as I’m not going to be around for several weeks, I wanted to wish you all the very best for Christmas and the New Year. Hope to catch up with you again in Feb 2016.